One thing I’ve learned in my time as a DC fan is that if an actor does an exceptionally well job of playing a certain character in either a movie, TV show or animated production, then there’s a pretty good chance they’ll be offered gigs in future endeavors. A recent example would have to be that of Sam Witwer, who debuted as Davis Bloome (the human side of Doomsday) on Smallville before later voicing Ocean Master in Justice League: Throne of Atlantis. And now, he’s been hired as Supergirl season 4’s big bad, Agent Liberty. When it comes to the latest addition to the club, it’s very hard to imagine a greater about face, for none other than Cameron Monaghan has been enlisted to lend his pipes as Superboy in the upcoming animated film Reign of the Supermen. 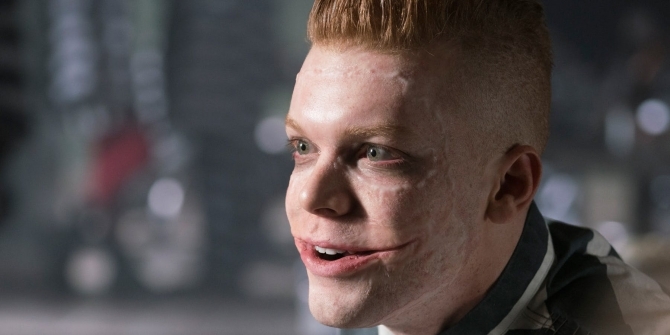 If his name sounds familiar to you, it damn well should because he’s turned in some brilliant performances over on Fox’s Gotham in the past few years as both Jerome and Jeremiah Valeska. To put it succinctly, each of those fellas offer different takes on the Joker persona, and Monaghan has done a fine job of making one very distinct from the other. That said, I’m excited to see him doing a 180-degree turn as Conner Kent/Superboy. Rest assured that his casting was confirmed by the sneak peek at Reign of the Supermen that’s included on The Death of Superman Blu-ray due out August 7th (you can read our review here). What’s great is that said featurette is considerably longer than the one that made its way online last week, so you’ll be able to gain even more insight into the next DC animated offering. Right now, Reign of the Supermen lacks a concrete release date, but smart money says it’ll arrive on Blu-ray and DVD in either January or February of 2019.